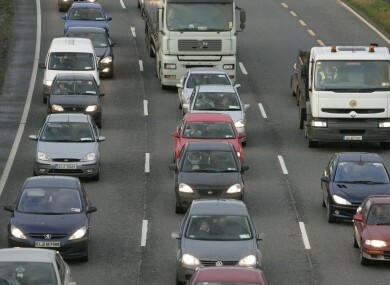 Irish workers cover an average of 278km every seven days, new figures show. PEOPLE WORKING IN Ireland spend an average of seven hours 50 minutes travelling each week – or 90 minutes for each weekday. The figures are revealed in the CSO’s National Travel Survey, which maps travel patterns across Ireland. It found that on average, people travel 18km to their workplace and spend 30 minutes getting there. Working people make an average of 19 journeys per week, travelling 278km in total. However, the survey showed a significant difference between the sexes, with men travelling further considerably than women. Although both sexes make the same number of journeys (17), the average man – both employed and unemployed – covers 257km while the figure for women is just 186km. Work is the most common reason for men to travel, while the biggest factor in women’s journeys is shopping. Unsurprisingly perhaps, there is also an urban/rural divide. People living in rural areas travel an average of 286km every week, more than 50 per cent further than the city-dwellers” figure of 180km. However, urban residents actually spend longer on their journeys – although the distances are so much shorter, they travel for an average of 414 minutes a week against 387 for those in the country. People in cities also made more individual journeys. Nationwide, 73 per cent of journeys were made by car. Walking accounted for 16 per cent, bus for four per cent and all other methods for six per cent. Email “Commute much? Working people spend eight hours a week travelling”. Feedback on “Commute much? Working people spend eight hours a week travelling”.